You can download WSO2 Storage server 1.1.0 which ships Cassandra explorer and many interesting tools to manage storages. Please follow the following links for documentation to use Cassandra Explorer. Cassandra GUI evolved from its first version and new version includes bug fixes and enhanced features. Filtering non displayable data and label them with warnings. Connect to Remote Cassandra server without restarting the server. Following screen shots include a quick flow on how it works. 1) Click connect to cluster on right hand side panel. Give connection URL and credentials (if there is any) to connect. 2) After a Successful connection you will be directed to keyspace listing page. Which will include Keyspaces and clickable column family names. Click on a Column Family to Explore data. After clicking the column family you have landed in the row view page. It includes rows of your column family and a slice of column data as a summary. You can search, paginate or change no of items to filter your data. Click "view more" to explore a single row. 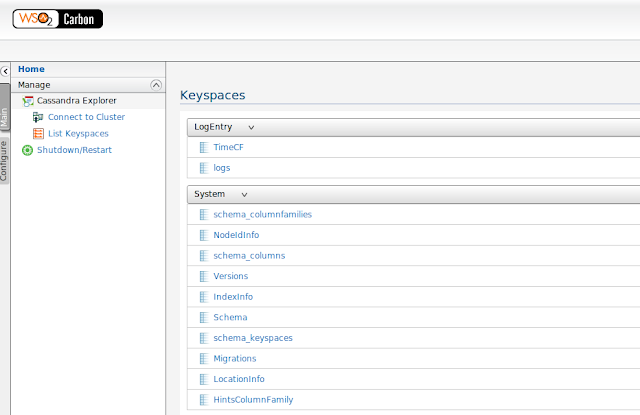 4) Column family view page will list all the columns in a single row. You can filter the data with column name,value or time stamp. full numbered pagination is available. 1) I can not change data in my keyspaces from this tool, this tool is that just serves to display the data, and not edit or delete them?! 2) in our project was that data in XML format, and aparament your program, he interprets the XML into HTML, so, I not show my data correctly, but they maquent lot of things. thank you answer me and tell me how to solve these problems. 2) It was a bug and it has been fixed (Had to escape XML special characters to avoid swallowing xml tags). If you are in urgency to add that patch i can provide you with the steps. Or else will share the released version soon. I get the following error while listing rows from a column family. DataTables warning: JSON data from server could not be parsed. This is caused by a JSON formatting error. Have you kept the tool idle for a considerable time like 20 mints or more. Were there any error logs at the console. There is a bug that when session got timed out it does not give a proper warning. We will fix it soon. As a workaround you can login through the management console again and continue for the moment. I've got the same error as muthu.v when I'm trying to browse a CF. I'm trying to open the CF just after loging in so it's not a timeout problem. We are using CompositeType in our CF, don't know if it could cause the problem ? Could not find the main class: Files\wso2carbon-4.0.0-SNAPSHOT\repository\conf\carbon.xml. Program will exit. Did I miss something? Or can you fix this issue? thanks a lot! I was looking for simple readonly tool for cassandra data access. Thanks for this information. We are storing data in JSON format for cassandra 1.0.7. I am trying with Carbon 4.0.0. JSON format error popping due to a limitation in the UI framework used. Whenever there is an exception it is not possible to send it to UI in a proper format, thus resulting this. You can have more details at the backend server log normally. Now Cassandra Explorer is a part of WSO2 BAM server. Can you try it and see if that resolves the problem. You can download it from here. http://wso2.com/products/business-activity-monitor/ . If the error persist could you please share if there are any errors logged at the console. Hi Shelan, i was also getting same JSON data from server could not parsed error. My problem is this tool show me the keyspaces present but not the ColumnFamilies (Tables) present in the keyspace. I do see these errors whenever I start my 'defense4all' application & eventually the application stops running. I checked "cassandra.yaml" & I do see there is an entry for localhost:9160 as rpc address/port. Not sure what exactly I need to do (in cassandra) to make this work. I am able to run Cassandra successfully as foreground process. I figured out the solution. Hope it helps other.. In cassandra.yaml, we MUST set start_rpc = true (for me it was false). be a configuration question that I missed. Wishes are the best way to express you desire and happiness with your loved ones. Here we have the unique collection of Happy Deepawali 2016 wishes and Diwali 2016 greetings that you can use to wish your friends and family members an extremely great HAPPY DIWALI MESSAGES 2016. IBPS SO Answer Key released. Get the complete information about IBPS SO Answer Key. Check the Telangana ICET 2017 Exam Results now. To get the TS Integrated Common Entrance Test Rank Card 2017 click here. That's very useful information that is furnished on this web page. Keep it up! A commitment of gratefulness is all together to show this rich stuff to us! Oversee sharing! I am new inside the weblog binding. Each altruistic web journals and posts are not basic for the perusers. Here the essayist is giving sensible character and proposition to each and every peruser through this introduction.